My mom just finished knitting these adorable baby work socks for the wee one! They are super cute and stay on her feet really well. It took a while to find a good knitting pattern for baby socks but the search was worth it. My mom decided to make them in lumberjack (sock monkey) colours, just like real work socks. Knitting baby socks can be very rewarding. Since the baby isn’t walking on the socks, they don’t really wear out. Knitting baby socks also doesn’t take as long as adult socks. They also fit right over sleepers and can be worn instead of baby shoes. They’re just as warm and just as cute. Now our whole family has matching work socks with the red stripe! The pattern used for these wool socks was the “Stretch Baby Socks” pattern by Patons (free on Ravelry). My mom did change the pattern a bit by only ribbing the top portion (the white band with the red stripe) instead of ribbing all the way down to the heel. The pattern uses double-pointed needles. Both my mom and I like working with the knitter’s pride wooden needles. They’re quiet to work with and don’t get cold like metal or plastic knitting needles. These socks were made on Size 3 Knitter’s Pride Laminated Wood Double-Pointed Needles. 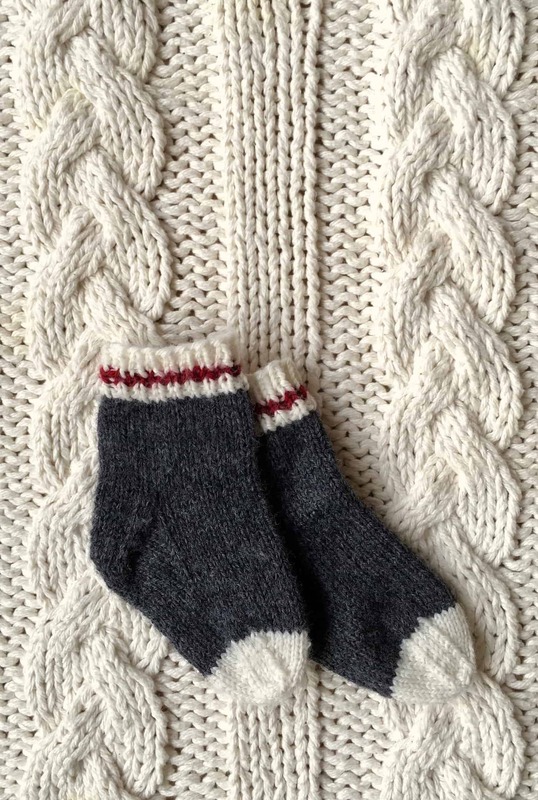 The wool used for knitting these baby socks was Berroco Vintage DK yarn. This yarn is a blend of acrylic, wool, and nylon. There are some really nice colours available in this line. The grey we chose was called “cracked pepper” (colour 2107). You could really use any combination of colours, but we liked the work sock colour combo for the baby monkey sock look. 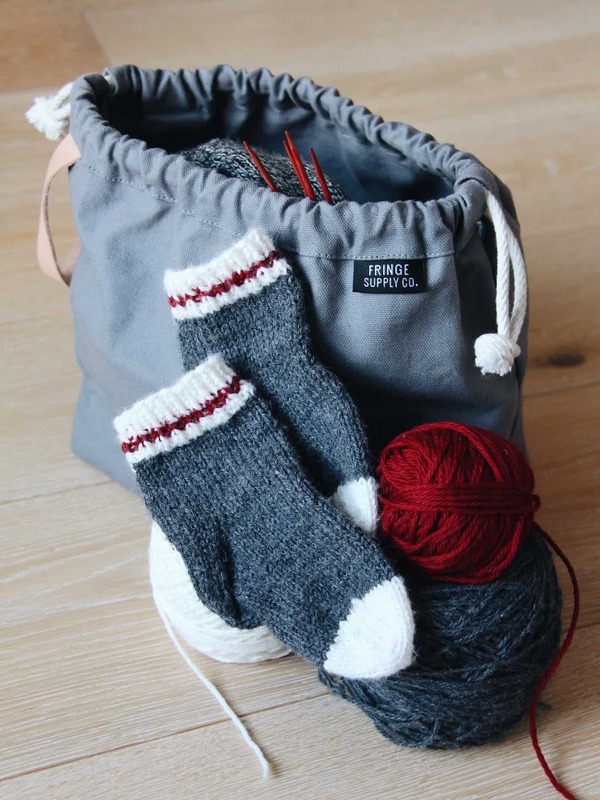 If you intend to put the socks directly onto the baby’s feet, you may wish to use acrylic yarn if the baby is sensitive to real wool. 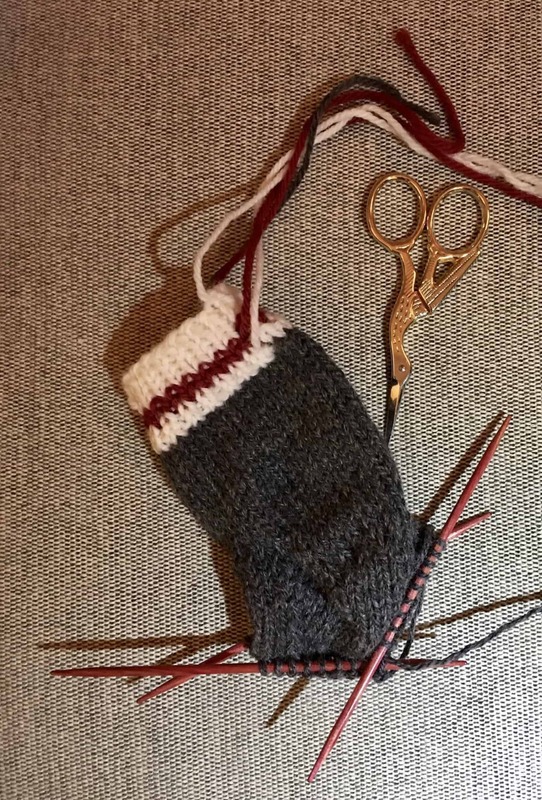 If knitting socks isn’t your thing, it is possible to order hand-knit baby work socks from Etsy. Some of them are called “baby work socks” while others are called “infant lumberjack socks” or “kids monkey socks”. I found this super cute pair that’s very similar (with a very cute white heel). I also like these infant lumberjack socks, which come in various sizes and colours and look long enough to fold over. The grey cotton sleeper pictured with the socks is from babyGap. It’s one of the sleepers with snaps that also comes with fold-over mitt hands. Saving this for later? Pin it! 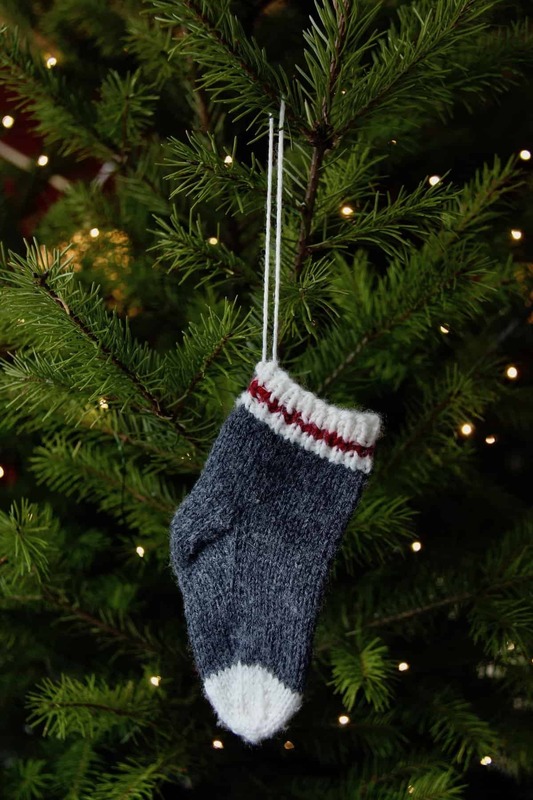 Update – here are the socks as baby’s first Christmas stocking ornaments!